Isn’t it funny and terrifying how a whole week can pass and you just wake up at 4:30am on a Sunday morning and realize that? Oh, wait…I just used a calculator to double-check myself, because it IS 4:30 in the morning, and the first cup of coffee hasn’t gone down yet, and IT’S BEEN 13 DAYS! How has it been 13 days? 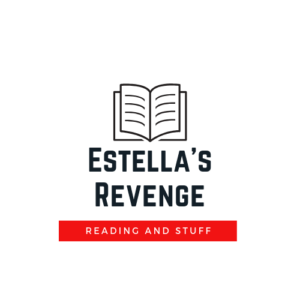 Was Reading | Sadly, this has not been a great reading month so far. I’m taking comfort in the fact that it’s only roughtly half over, and hopefully I won’t wake up tomorrow and it’s been another 13 days. Also sadly, I did not finished Jen Hatmaker’s For the Love that I mentioned in my previous Sunday Books and Stuff post. It was funny and charming and real and enlightening, but it also just wasn’t the right time, so I’ll probably circle back around to it sometime. Now Reading | Now I’m actually reading a harder-hitting book: You Are Free: Be Who You Already Are by Rebekah Lyons. As I’ve mentioned here, I’m neck-deep in the Bible. Well, more than neck deep. Over-my-head-drowning-in-information is more like it. My whole faith is changing–for the better, I might add–and this book is tapping into some really important realizations that I’ve been taking up with God. You can read more over on my faith blog, Rowdy and Redeemed, after I have this cup of coffee and actually write a new post over there, too. I’m also dipping into The Dark Dark: Stories by Samantha Hunt. I read her previous novel, Mr. Splitfoot, back in 2016 and loved it. It was one of my favorite books of the year. I didn’t even realize she had a new story collection (check it, Andi….she’s had two books since then) until I saw The Dark Dark recommended somewhere. I’m sorry, whoever I read this from, my brain…it’s a sieve. I’ve only read a couple of the stories, but they’re just as dark and whimsical and twisty as I’d expected. Amazing. Listening | I’m heavy into The Bible Project. Specifically I’m listening to their “Walking with God” or just “God series” for short. It scratches all of my theologically nerdy, linguistically-oriented, research-based itches. In the opening episode of this particular series, the hosts discuss what a terribly limiting and loaded word “God” is in English and how the various forms of “elohim” in Hebrew are much more specific. So. Fascinating. Blogging| Not really blogging-blogging…I had to reschedule the State of the Blogger chat from the previous post on this page. I had tech issues, but I will be coming back to it! 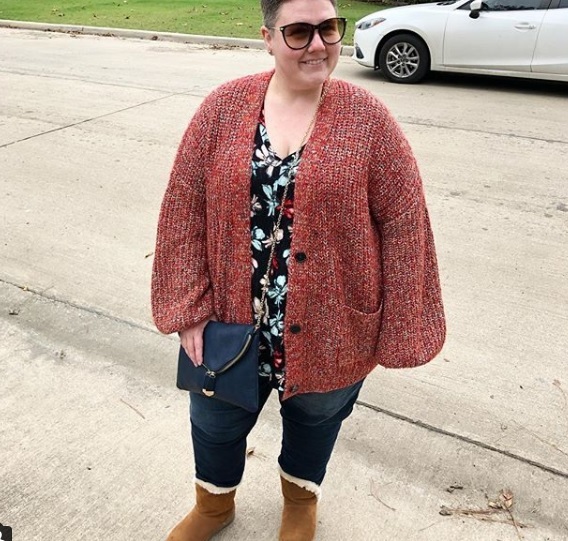 Sweater and boots from Target’s Universal Thread, floral tank from Lane Bryant, jeans from Walmart, bag from Dia and Co, and glasses from Michael’s. Doing | Playing SIMS4’s new expansion pack, Get Famous. A little backstory on me and this damn game. The original SIMS came out in 2000, and I’ve been playing it on PC ever since. THAT’S 18 YEARS! How has it been 18 years? I’m having a lot of those moments lately, especially having turned 38 on November 10. Whoa. Just whoa. It’s an addiction. I’ll post more about it sometime. Wearing | All the cute things. I went into I-shall-not-shop mode a couple of year ago, specifically when I stopped working full time and focused on teaching online and a limited amount on-ground. As can be the case, I stopped giving two shits about what I looked like most of the time. It’s a trap when yoga pants are one’s daily uniform. Anyway, I teach three mornings and one night per week outside the house now, and I finally decided to get myself together and replace, update, and throw away some of my old stuff that I was hiding in. The picture above was from some weekend shopping. 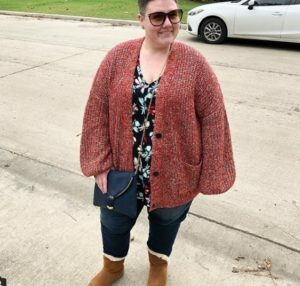 It was coooold (to us) in Texas, and this is the coziest sweater ever made by human hands. The pic down below is from this weekend. 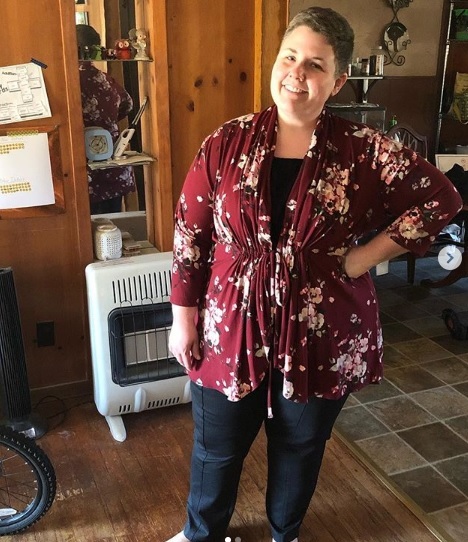 I received my second Dia and Co box–it’s like Stitchfix but exclusively for plus sizes–and I immediately fell in love with this floral, drawstring cardigan and some new dark wash skinny jeans. I also kept the ponte, straight-leg pants in this photo. My mom has them, and will wear them on a weekly basis probably, but they fit me and I can borrow them if I need a more work- or event-appropriate pair of slacks. Right now I’m a jeans girl 99.9% of the time. YAY, TEACHING! Note: the Dia and Co link above is a referral, and if you decide to use it, I’ll get some money off my next box which would be AMAZING! Loving | Thanksgiving break! Greyson has the week off, but I do have to work Monday and Tuesday (and grade from home the rest of the week). One of the cool parts about my job is that I have so. much. freedom. I’m planning to take him with me on Monday. I scheduled office hours/conference time for my students, so they can come and go as they wish with questions or for tutoring. I’ve taken him with me on days like this in the past, and he has a great time drawing on the whiteboard or playing with the SmartBoard. He also watches videos on the SmartBoard. He gets tickled when the students come in and talk to him. That’s it, friends! That’s my brain dump for today. If you’ve stuck around this long, you get a very large gold star. What have you been up to? Let’s chat in the comments. Isn’t it amazing how good a nice outfit can make you feel? You look fantastic! It is! I’m so glad I’m recognizing that again. What would be funny and terrifying for me would be waking up at 430 in the morning and staying awake after that. 😉 But glad to see you here no matter what time it is. 🙂 Here? I haven’t been up to much. In a reading slump but have a reread planned for later this week so hope that will help. Hahaha! Sadly it’s pretty normal around here…dog- and kid-induced insomnia. lol I hope your re-read helps the slump! I LOVE that floral cardigan – it’s gorgeous. I’m deep into floral prints right now and have to keep myself from buying too many. I feel like a little of this kind of print goes a long way but it’s hard to resist. I’m going to be starting a new (cooking) blog in January and will shoot you the link or page when it’s up and running. I miss our blogging world and am looking forward to seeing what it looks like now.